Adventures in the Endless Pursuit of Entertainment: Coats from In the Heights! Coats from In the Heights! 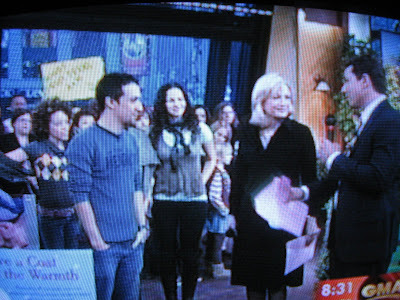 Lin Manuel Miranda, Mandy Gonzalez, Janet Dacal and Marcy Harriell of In the Heights were on Good Morning America this morning to drop off coats they collected for GMA's Warm Coats & Warms Hearts Drive. This warms my heart on this very, very cold day.